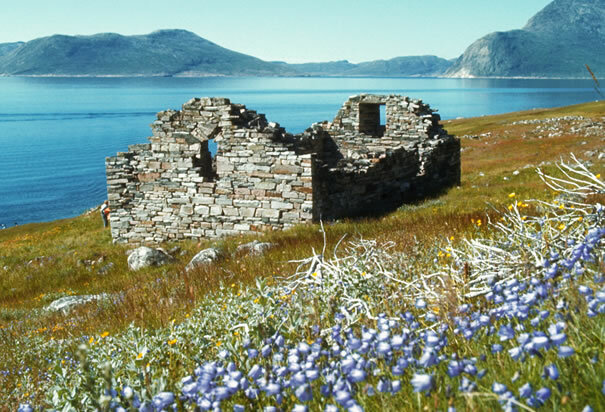 To visit the ruin's of Greenland's Hvalsey Church is to take a pilgrimage back through time to the very farthest outpost of the Christianization of medieval Europe. Located at the very southernmost tip of Greenland, Hvalsey Church was built in the mid-12th century and was meant to serve the sparse and scattered Norse Catholic settlements of Hvalsey Fjord and the neighboring fjords as well. Though the Norse long ago evacuated their Greenland colonies for reasons that are still unclear, the finely constructed stone church of Hvalsey remains amid the silence of the flords and fells, a testimony to the vitality and westernmost boundary of European Christendom in the high middle ages. Once surrounded by a thriving Catholic community, the lonely ruins of Hvalsey is all that remains to tell the tale of medieval Greenlandic Catholicism. The exact date of the church's construction is unclear; the settlement at Hvalsey dates back to the time of the family of Eric the Red, whose uncle established a farmstead there around 985. At that time, Christianity was only beginning to take hold among the Norse (Eric the Red was a pagan, but his son Leif Ericsson adopted the faith under the influence of the Christian King Olaf Tryvasson). But by the 12th century, the Norse were firmly in the Catholic fold, and the Norse settlements in this part of Greenland, known as the Eastern Settlement, boasted some 4,000 Norsemen. From 1000 to 1250, Catholicism in Greenland flourished. The kings of Norway established a diocese there in 1124 at the settlement of Garðar, which boasted a succession of nine bishops. The Norse erected sixteen parish churches and a convent for Benedictine nuns as well. There are surviving correspondences between the papal court and the Catholics of Greenland, for whom the medieval popes always demonstrated a paternal concern. "Beside Einar's Firth lies Hvalsey Fjord. There is a church there called Hvalsey Fjord Church. It serves the entire fjord and all of Kambstad Fjord as well, which is beside it. On this firth stands a large farmstead, which belongs to the king and is called Thjodhild's Stead." In its hey day, the parish at Hvalsey was surrounded by fourteen other structures, possibly storehouses, priest's quarters or other residential homes; these have all vanished save for a few stones here and there, leaving Hvalsey Church alone beside the lonely fjord. The structure as seen today is 26 feet high at its peak and approximately 16 feet wide. The stonework resembles similar Norse churches built in Scotland's Orkney Islands, leading some to believe it was constructed by Scotch-Norse stonemasons specially ferried in for the task. The stones are of various sizes, but were chosen with meticulous care and fit very well together. The largest of these stones weigh up to five tons, although most are smaller; the walls are four feet thick in some place. The church is 52 feet long and was originally plastered with a compound made of ground mussell shells, which would have given it a whitewashed appearance. The long vanished roof was made of wood and turf. Hvalsey was probably the best maintained of all Greenland's parishes due to the fact that it stood on land owned immediately by the royal house of Denmark, as noted in Ivar Bardarson's report quoted above. Nevertheless, fate was not with the hardy Norse settlers of Greenland. As the climate began to cool towards the end of the middle ages, it became increasingly difficult to ranch and farm and the Norse had to rely increasingly on imports from Europe, trade with the Inuit and the hunting of whale and seal for food. As communications with Europe worsened due to various factors, supply ships became increasingly rare. The episcopate died out in Greenland in 1378, and the priesthood soon after. For some years Norse Catholics continued to assemble for prayer in their parish churches; at the Cathedral of St. Nicholas at Garðar, the highlight of the liturgical year was a ceremony in which an altar cloth used by Greenland's last bishop was exposed for veneration once a year. The last recorded Christian rite in Greenland was a wedding celebrated in Hvalsey Church in 1408. It is believed that the Norse evacuated the island soon after, probably around 1450. Hvalsey is a testament to the vitality of medieval Christianity. Under the aegis of a common faith and culture, medieval Catholicism knew of no locate too remote, no windswept moor or desolate peak so far off the beaten path as to render it unfit for the service of God. Despite the harshness of the land and the difficulty of life at the Eastern Settlement, its hardy Norse-Catholic populace would sooner endure the months without sunlight in the fierce arctic climate rather than a settlement without a parish Church where the light of Christ could burn ever on. May the Church in our own age regain even some of the constancy of these noble forebears!